—recommended additional study material for this text. 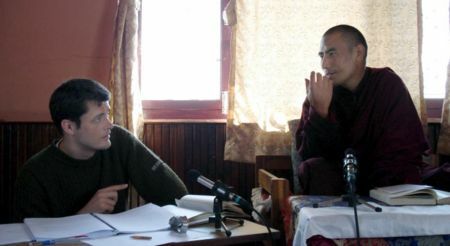 The recordings were made during Rigpa Shedra East 2006/2007 in Pharping, Nepal. Khenpo teaches in Tibetan. The recordings contain English translation by Gyurmé. The teachings were completed on the 4th of April 2007. The Padmakara Translation Group has published a complete English and French translation of Khenpo Kunpal's commentary: Nectar of Manjushri's Speech—A Detailed Commentary on Shantideva's Way of the Bodhisattva, Shambhala Publications 2007, ISBN 159030439X , see Wisdom-books. For chapter 9, Wisdom, there is a translation of Khenpo Kunpal's commentary available in Wisdom: Two Buddhist Commentaries, Editions Padmakara, ISBN 2-906949-22-1 . In addition to the translation of The Nectar of Manjushri's speech, this edition contains the commentary The Brilliant Torch Illuminating the Ultimate Nature of Profound Interdependent Origination by Minyak Kunzang Sönam: see Wisdom-books. Practicing Wisdom is a commentary by the Dalai Lama on Shantideva's chapter 9 on wisdom from the Guide to the Bodhisattva's Way of Life, drawing on contrasting Nyingma and Gelug school viewpoints using the same two commentaries as in Wisdom: Two Commentaries, Wisdom Publications, ISBN 0861711823 , see Wisdom-books. This page was last edited on 13 January 2013, at 01:17.